3659 ✉ 144,18 15 Ã¸re (2) and 50 Ã¸re airmail on very nice air mail letter from \"Copenhagen 25.9.33. \" with special confirmation stamp \"German catapult flight D. Bremen New YORK 1. / 2. 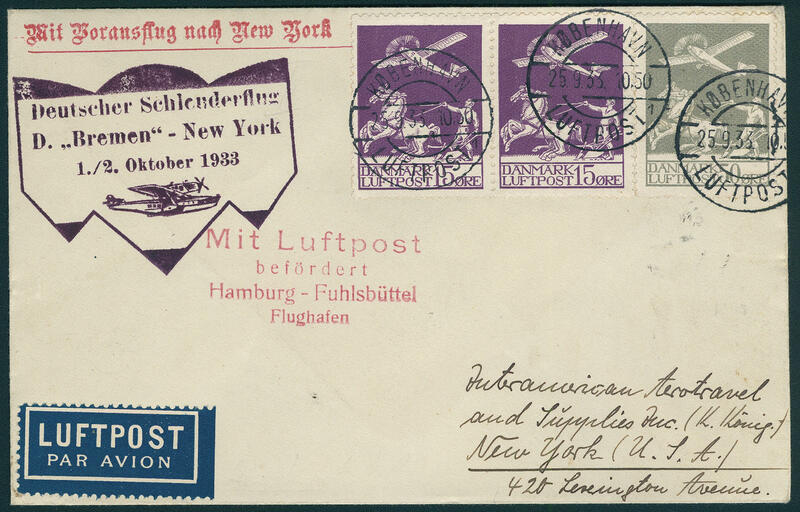 Oct 1933\" and red four liner \"with airmail transported HAMBURG-FUHLSBÜTTEL airport\" to New York. Very decorative and rare! (Haberer no. 147 DK). 3660 Karte 144/45,180 Airmail, decorative three colours franking on very nice airmail postcard from \"KOBENHAVN 21. 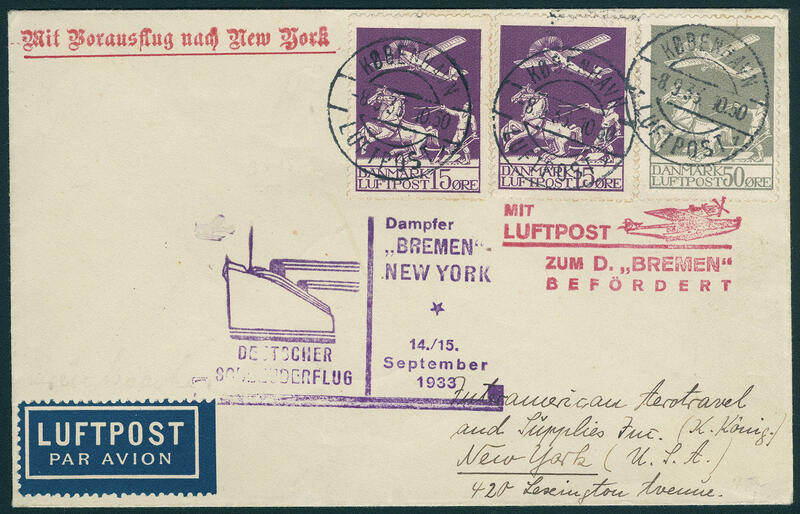 SEPT. 1931\" with additional red stamp \"German catapult flight steamer Europe NEW YORK 27. 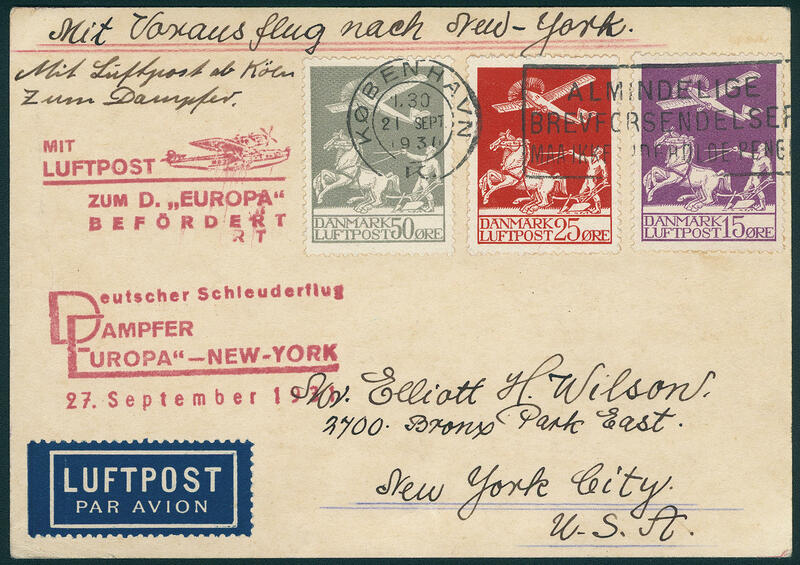 SEPTEMBER 1931\" respectively \"with airmail to the D. Europe transported\" to New York. Rare! (Haberer no. 64 Dk). 3661 ✉ 174,18 15 Ã¸re (2) and 50 Ã¸re airmail on very nice catapult flight letter, mailed with two ring cancel \"KOBENHAVN 8.9.33. 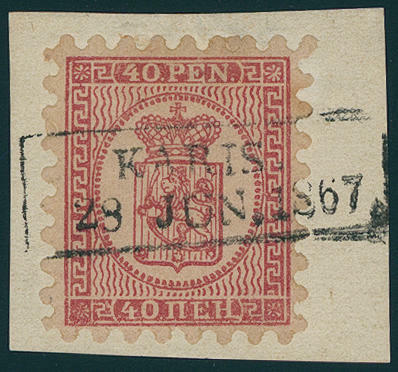 \" and additional violet stamp \"steamer Bremen New YORK 14. / 15. 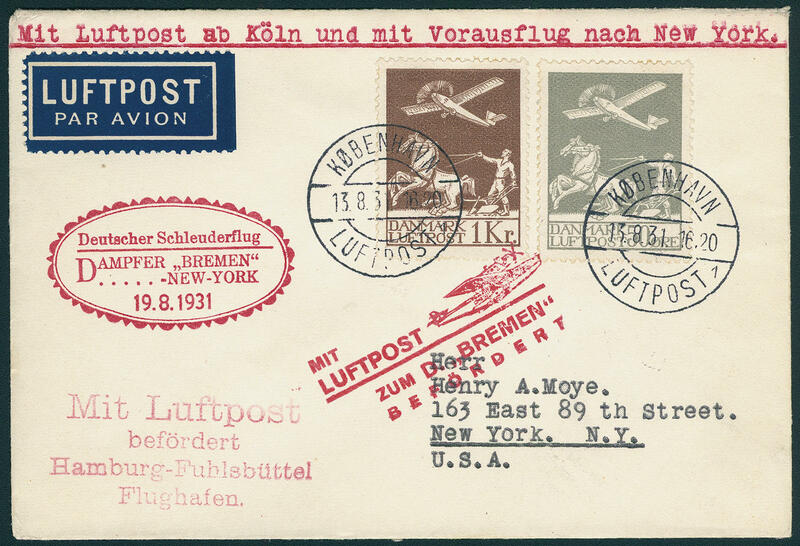 SEPTEMBER 1933\" and red stamp \"with airmail to the D. BREMEN transported\" to New York with on the back transit cancellation \"Cologne airport 9.9.33. \". Rare! 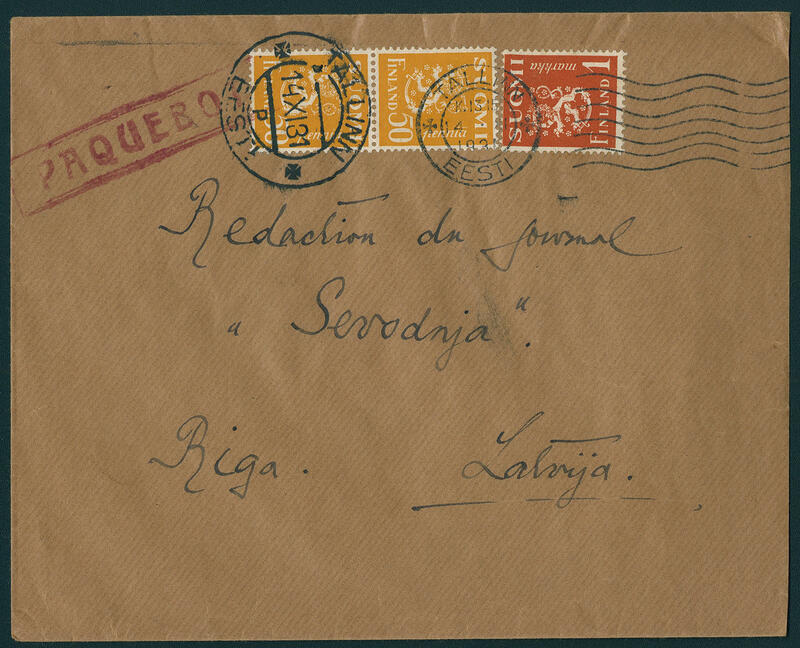 3666 ✉ 148, 150 Finland, decorative franking on cover, tied by two different postmarks \"TALLINN 14. XI. 31. \" and additional red rectangle cancel \"Paquebot\" to Riga / Latvia. 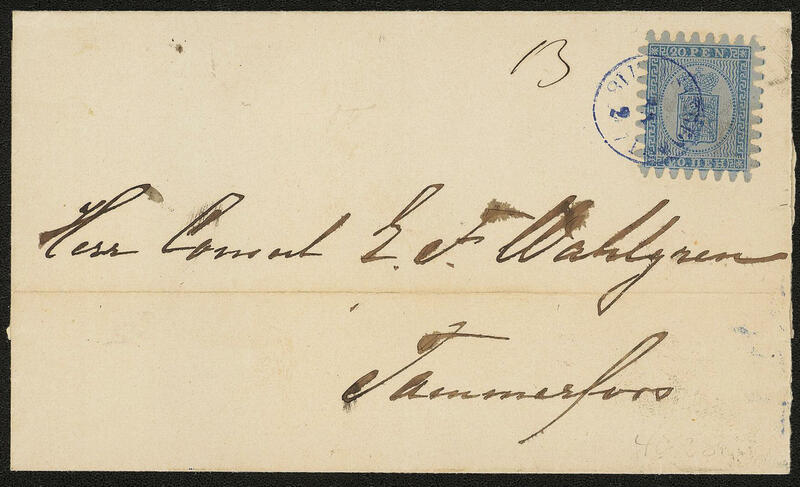 Scarce commercially ship mail usage! (Michel no. 148, 150). 3667 ⊙ 1I 5 Kop. Blue, small pearls, wonderful fresh colors and with wide margins, minimal Inks trace, centered rectangle cancel \"WIBORG 6.9.1858. \". A very nice copy this Finland rarity! Photo expertize Gummesson. 3668 ∆ 1I 5 Kop. Blue, small pearls, wonderful fresh colors and all side evenly well with wide margins on magnificent letter piece with clean mounted turning into rectangle cancel \"KARIS 2. February 1857\". An outstanding quality this Finland rarity for the highest standards! Photo expertize Gummesson. 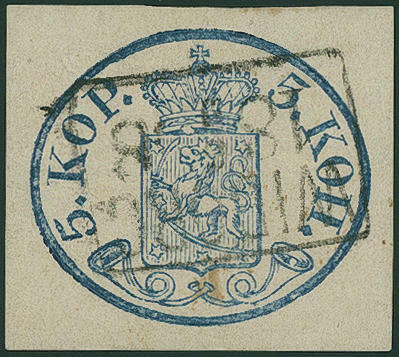 3669 ✉ 3B 5 K. Dark green blue on gray blue, roulette B, horizontal pair, wonderful fresh colors with perfect roulette on magnificent cover with clean mounted single circle postmark \"JOROIS 20.11.1865\" to Tavastehus with transit and arrival postmarks. An especially nice and rare cover for the highest standards! (Facit catalogue no. 3 C2 a, Norma no. 3 BLb). Photo expertize Jussi Tuori. 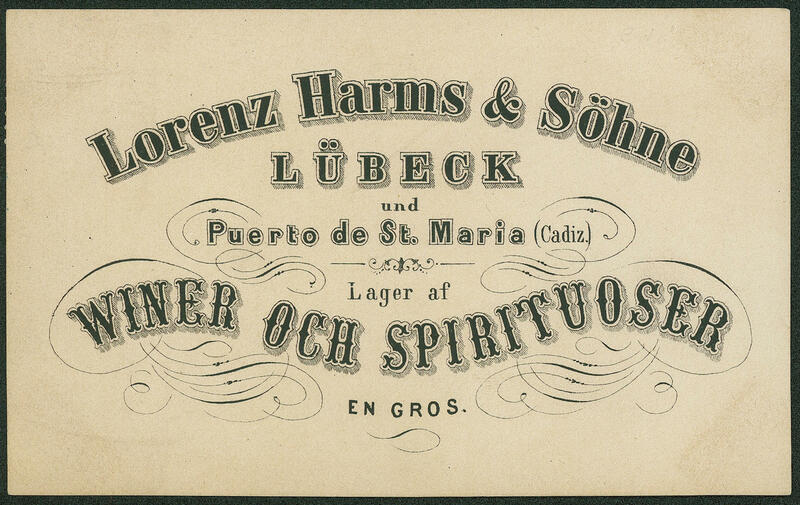 3670 ✉ 5Cz 5 P. Brown lilac, roulette C, fresh colors, a few tongues a little shortened, on very decorative advertising card the Wine action Laurence Harms & sons Lübeck & Cadiz with blue single circle postmark \"subscription\" from 1879 to Bjorneborg. An extraordinarily attractive and scarce printed matter franking! 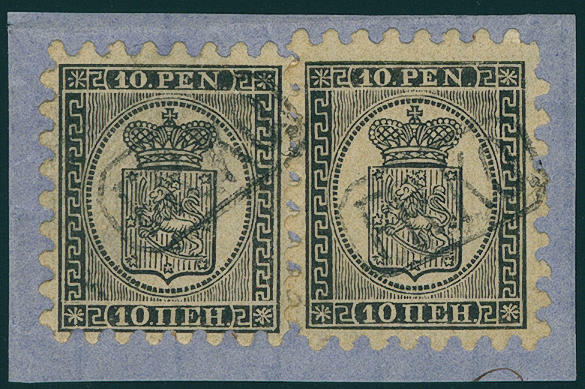 3671 ∆ 6Ax 8 Pennia black on yellow green, horizontal strip of three, wonderful fresh colors with all tongues on magnificent letter piece with clean mounted blue single circle postmark \"WIBORG\". A wonderful copy of this rare unit for high standards! Photo expertize Grönlund. 3672 ∆ 6Az,8Ay 8 Pennia black on ribbed yellow green paper, horizontal strip of three, wonderful fresh colors with perfect roulette in combination with 20 penny blue on single gray blue paper, fresh colors, two tongues shortened, on magnificent white letter piece with clearly blue single circle postmark \"WIBORG 22.6.1875. \". One of the most beautiful known strip of three of this rare stamp! Photo expertize Gummesson. 3673 ∆ 7Ay 10 Penniä black on single chamois paper, two examples wonderful fresh colors with all tongues on magnificent letter piece with two clearly frame cancel \"FR. KO\". An exception copy for your highest requirements. This fantastic copy ties rarity, beauty and excellent quality! Photo expertize Gummesson. 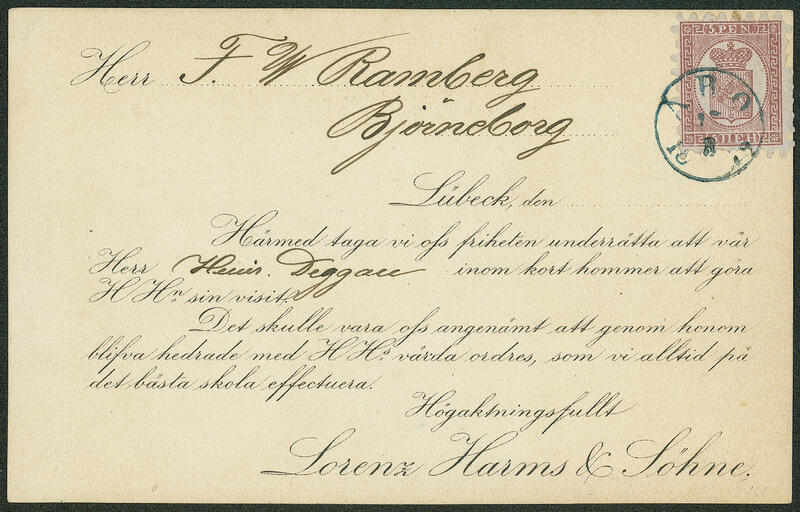 3674 ✉ 8C 20 P. Blue, fresh colors with all tongues on very nice white cover with attractive violet blue single circle postmark \"HELSINGFORS\" (cover without right side flaps) to Tammerfors. 3675 ∆ 9Ax 40 Penniä rose-carmine on single, dull rose paper, wonderful fresh colors with all tongues on magnificent letter piece with perfect clear rectangle cancel \"KARIS 28. June 1867\". The most beautiful us known copy this very rarely issue, for your highest requirements! (Facit catalogue no. 9 v1 C1 a, Norma no. 9 Aya). Photo expertize Gummesson. 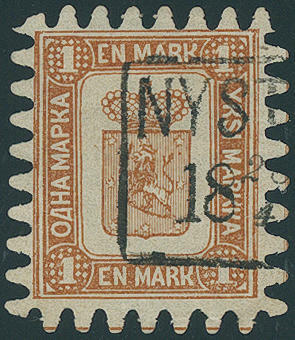 3676 ⊙ 10C 1 Markka yellow brown on white 1867, wonderful fresh colors with all tongues and clean, clear mounted rectangle cancel \"NYSTAD\". In this excellent quality almost never offered. A piece of dream for high standards! Photo expertize Gummesson. 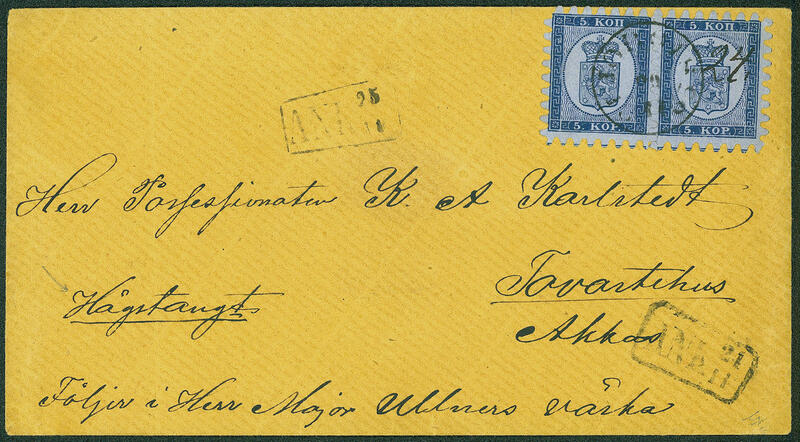 3677 ∆ 10C 1 Markka yellow brown, wonderful fresh colors with all tongues on magnificent letter piece with perfect single circle postmark \"KASKÖ 8.10.1872\". A dreamlike nice outstanding quality for your highest requirements! Photo expertize Jussi Tuori. 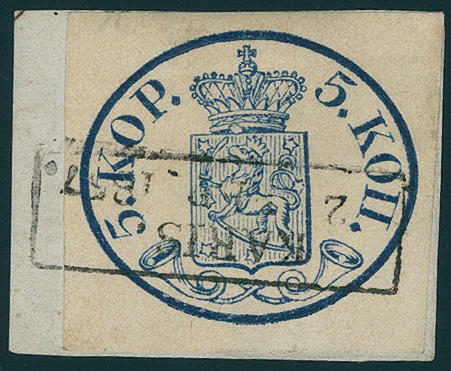 3678 ∆ 16BaK 20 Penniä gray blue 1875, perforated L12 1 / 2, horizontal strip of three with tête-bêche, fresh colors and very well perforated on very nice package cards cutting with clear two ring cancel \"JYVÄSKYLÄ 23.2.83. \". 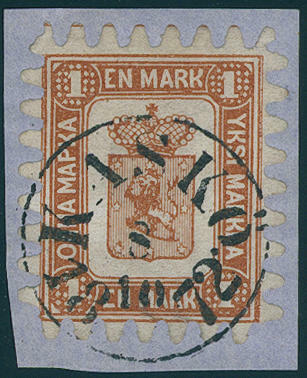 An exception copy this Finland rarity for the highest standards! Photo expertize Gummesson. 3679 ⊙ 16ByaK 20 P. Blue, perforated L12 1 / 2, horizontal strip of three with tête-bêche, wonderful fresh colors and in perfect condition perforated, neat cancelled \"WILLMANSTRAND 28.10.84. \". An outstanding quality this Phila rarity! Provenance: collection Faberge. Photo expertize Gummesson. 3777 1 10 C. Montgeron 1969, the very scarce 1. Coil stamp for vending machine fresh colors and in perfect condition mint never hinged, without any signs. There are only few examples hereof have been preserved! Michel 8000,- €. 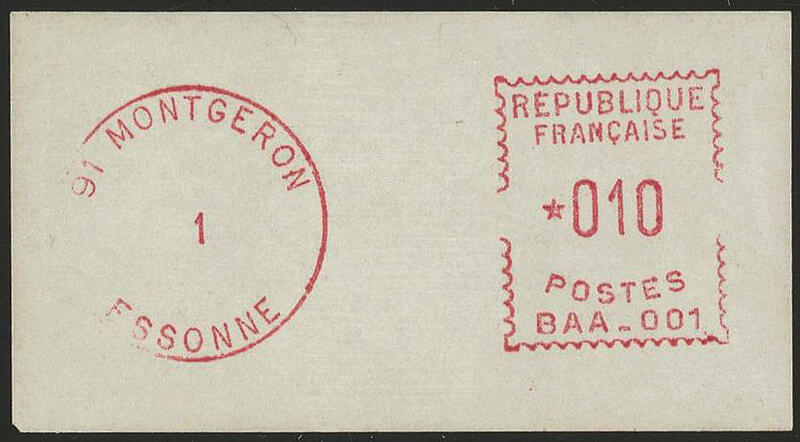 3778 ✉ 1 20 C. Montgeron 1969, the very scarce 1. 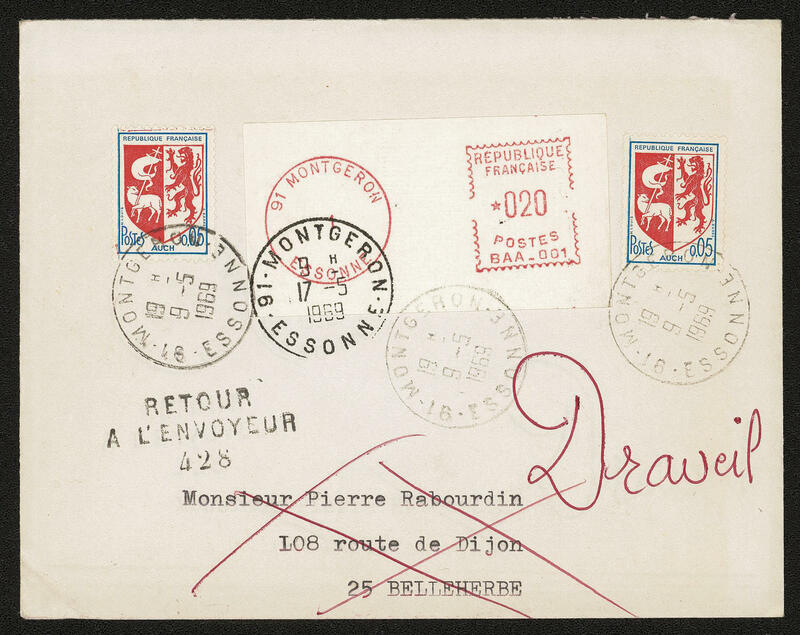 Coil stamp for vending machine, in perfect condition with additional franking on decorative cover from \"MONTGERON 9.5.69\" to Belleherbe and returned with transit and arrival postmarks. Very rare! Michel for single used 4000,- €.